This salad screams all things summer at me, and I am happy about it. Cleaning out the fridge. Trying to locate your beach towels and swimsuit after 11 1/2 months in storage. Running the dishwasher and taking out the garbage. Sending bae to Caribou for a rooibos tea latte with almond milk (heyyy caffeine free) to sustain your packing energy. Without caffeine. Doing a mental run-through on all electronic devices and related chargers – and this includes very important food electronics such as a blender and a spiralizer and a food processor because you know for a fact that there will be no such foodie luxuries at the cabin and you are confident enough to embrace your high maintenance food-loving ways. Planning to wear a cute outfit and do your hair but realizing you said you were going to leave an hour ago and you really don’t have time for that – plus, let’s be real, it’s the cabin and the only people you will see up there are, well, you won’t see anyone. Washing the sheets and making the bed so that you don’t hate life when you come back home again. Making sure you have that stuff that warm weather dwelling people wear when they go out in the sun – what do they call that again? Oh yeah, sunscreen. Do we even own sunscreen? Packing up a cooler with odds and ends from the fridge or freezer that might be able to be made into a meal, because you are Midwestern and you are scrappy above all else. And finally, shoving a mash up of winter, fall, and summer clothing into a suitcase (up north can get cold, as you know) and grabbing your sunnies and running out the door, getting in the car, and driving off into the great UP NORTH LAND. And then inevitably realizing you forgot something super important (no but seriously! it’s going to be such a long week without your almond butter) and then going back, and then leaving for real this time. In the midst of all this pre-cabin chaos, we have THIS SALAD. It’s very possible that I loved this salad so much because I was enormously hungry when I ate it last night amidst all the pre-trip planning and packing and last-minute chaos, but I also think I love it because it just completely embodies summer. It’s fresh dill. AHHHHHHH fresh dill! I sort of forgot about dill for a few years there, but wow. Its flavor is nothing short of fresh and cooling and miraculous. On top of the dill, it’s rotisserie chicken cut up into tiny pieces because you are in pre-cabin mode and rotisserie chicken is delicious. Go with it. And because it’s summer and veggies taste better this time of year, it’s cucumbers and spinach and fresh sweet corn and just a little bit of that garlic bite that we love. But in an effort not to get too veggie up in the house, it’s also goat cheese and WHOLE WHEAT ORZO. 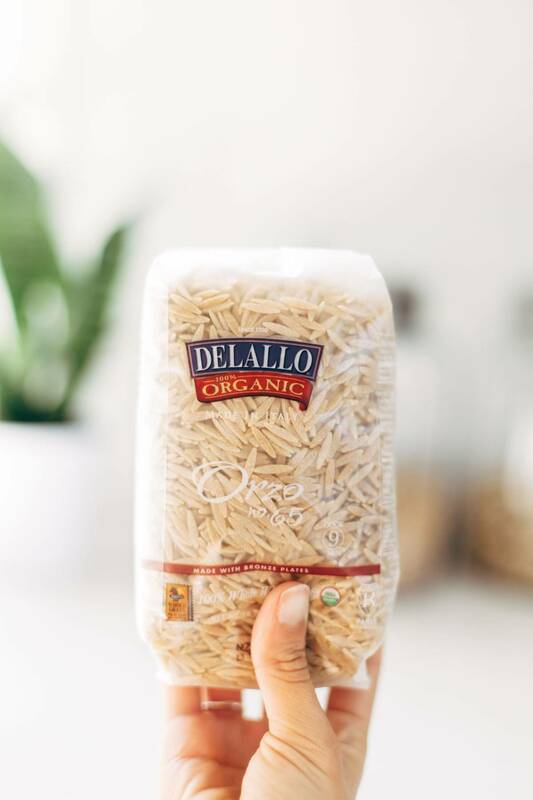 I have never in my life had whole wheat orzo until this moment and it is just everything. I literally stood over the stove just eating it, tossed with some straight up lemon juice olive oil sea salt magic, feeling only happy things because it’s whole wheat and it is the most fun shape/texture and it’s being paired with delicious whole foods and vegetables. Also see note about being enormously hungry. So naturally, let’s finish it off with a heavy handed drizzle of lemon juice and olive oil sprinkled with salt and pepp. Right? SO RIGHT. I hope you’re celebrating summer, whether it’s by going to the cabin to relax for a few days and/or making this salad in between all your rushing around. 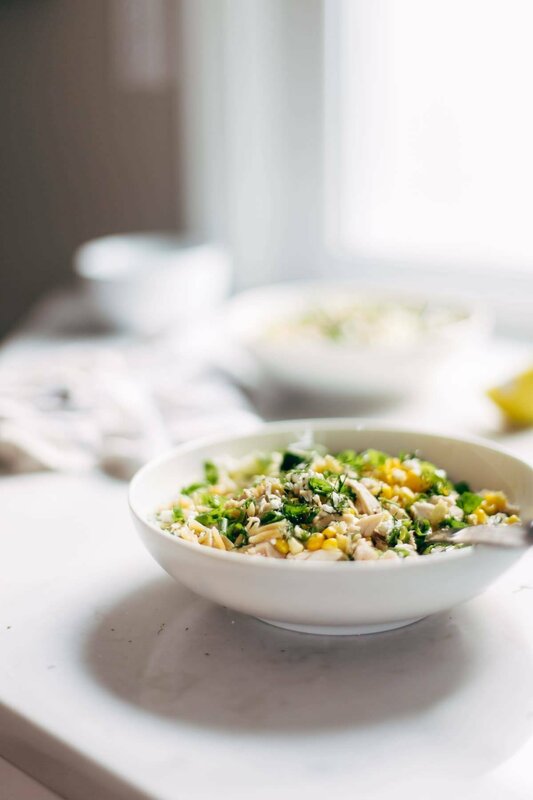 Summer = this orzo salad = joy. Orzo Summer Salad! With chicken and orzo, loaded with fresh veggies, and finished with a zippy lemon dressing and goat cheese. Heat a little bit of olive oil in a large skillet over medium heat. Add the garlic and the corn; saute until the corn is bright yellow and tender. Toss all ingredients together, including dill, green onions, and olive oil, lemon juice, goat cheese, and salt and pepper to taste. Serve hot or cold. YUMMYYYYYY. Nutrition label is based on 2 tbsp of lemon juice, 2 tbsp of olive oil, 1/4 cup dill, and 1/4 cup green onion for the dressing. If you really like sauce, you can up the amounts of lemon juice and olive oil to 1/4 cup. Looks yummy and fresh! I also dont use dill often enough. I think I might sub some zucchini for the cucumbers..I may also roast them cause yum! One question though. Goat cheese didn’t make it into the ingredient list. What kind of goat cheese did you use? The soft squishy kind, or the harder feta-type? Can’t wait to try it! Hey Christina! Good question – we just updated the recipe to include goat cheese (total space-out on my part) and I used the hard crumbled kind. I mean, it’s still pretty soft, but it comes in a tub where it’s already crumbled up like feta cheese so it’s easy to sprinkle on everything. Hope that helps! Oh hey – Midwesterners represent! Never apologize for rotisserie chicken 😉 And orzo?! Yumtown! PS: My husband and I just returned from a trip up North too! Lamb’s Resort on Lake Superior. Grand Marais. BWCA. We are ready to retire up there 😉 Have FUN! This recipe looks like the perfect summer recipe. I bet I could even cajole my kids into eating this…and just this for dinner. Okay so I can’t tell you how much I LOVE this recipe. I was so psyched because A. we just came back from the cabin life and yesterday were so tired from driving all day that we did the order a pizza thing and pick it up before showering. so TODAY I was ready for a fun date night dinner, and B. Rotisserie chicken. Um yes. My picky boyfriend gave this a 5/5 wouldn’t change a thing. I’m already planning when to make it again. Love hearing that! Glad you enjoyed it! Beautiful salad, unfortunately it isn’t summer where I am atm, but I would still eat this. Yumm! Yum! It looks like just the thing for hot summer days. Right!? Hope you enjoy it! Yes to the dill….so underrated! This looks like something I might have to make TODAY. SO underrated! Hope you enjoy it! Oh sounds amazing! Thanks for the comment Margaret! Hi Sharon! It’s actually goat cheese – thanks for catching that! We’ve updated it in the recipe. Lindsay, I think you forgot to put the goat cheese in the recipe below the post. I thought I saw white in that picture but I didn’t see an ingredient in the recipe. Thanks for catching that! We’ve updated the recipe to include it. 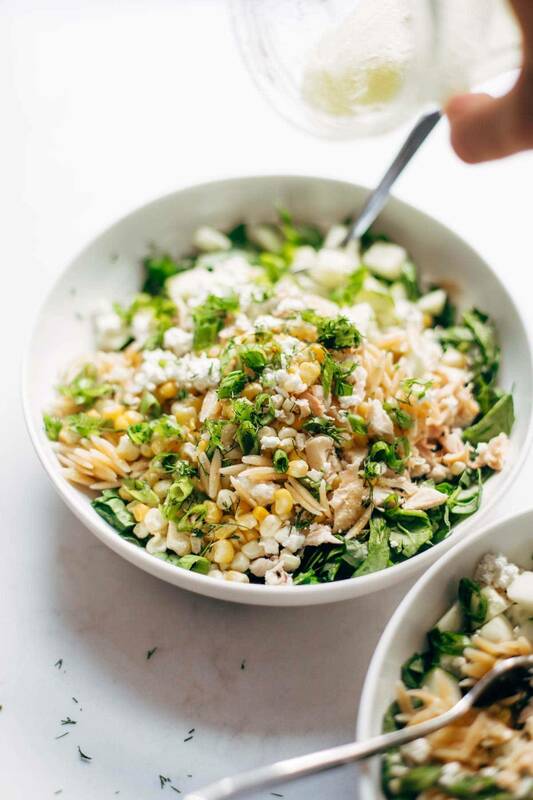 I love the orzo and corn salad! I never would have thought to use corn and cucumber and dill all in one dish but it was outstanding! Had this for dinner tonight and we loved it! What do you think would be a good GF substitute for the orzo?I can try GF orzo, but some of the GF pastas are no bueno! Maybe wild rice? I think quinoa would be a great option! I made this last night and it was soooooo good. I foresee this being a summer staple. Thanks so much! That does sound amazing! Glad you enjoyed it! Lovely salad! Perfect for the spring! oh my gosh my partner and I LOVE this!!! Thanks for sharing! Am I missing Where the nutritional info is? I tried looking,for it and cannot find it. This salad is favorite I’ve made it many times! My husband wants me to meal plan count cals and macros…it’s always so helpful when nutritional are included! Nevermind!!! My phone must have been doing something funny because I see them now. Thanks for this awesome recipe and many others!! Is this a good make ahead meal or does the spinach get funky too fast? You can make most of it ahead of time, but I’d probably wait to add the spinach and cheese until serving! Looks so tasty! I can use canned sweet corn for this recipe, can’t i? Will it have any problem if i mix the butter on the corn while it was cooking on the skillet? Hi Lita! Yes, canned corn is fine. Butter would be fine, but we really love the flavor of olive oil in this one!